New Zealand has announced its new high performance eventing squads, on the back of increased funding following the country’s bronze medal performance at London 2012. Equestrian Sports New Zealand was granted the largest increase of any sport in the country at the High Performance Sport New Zealand funding round late last year. It will receive $1.8m per year for the next four years leading up to Rio; a total of $7.2m compared to $3.2m in the previous four-year cycle. ESNZ high performance director Sarah Harris said the stringently-selected squads reflect only those combinations with the potential to produce an individual podium result at the Rio Olympics. Leading the way is the world’s number one ranked rider Andrew Nicholson who has six horses on the squad, along with the number four ranked Jonathan Paget with three horses, and the number six ranked Mark Todd who is also on with three horses. Rounding out the squad are London Olympic team-mates Caroline Powell and Jonelle Richards, along with World Champs team-member Clarke Johnstone and London Olympic reserve Lucy Jackson. Powell’s double Olympic horse Lenamore is not on the squad. The selectors are not considering him for Rio, but the 20-year-old will be likely to be competing at Badminton this year. Four up-and-coming riders have been named on the high performance eventing accelerator squad, in Jesse Campbell, Joe Waldron, Lizzie Brown and Tim Price. She sees the accelerator programme as vital to future of eventing. Both squads have an open door policy and can be changed at any time. The international eventing season kicks off with the Rolex Kentucky Three Day Event in April, followed by the Mitsubishi Motors Badminton Horse Trials. 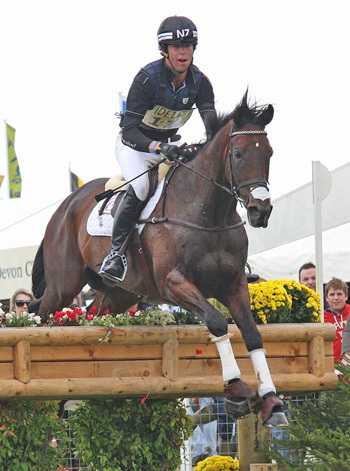 The World Equestrian Games in France in 2014 will be the first major event. Andrew Nicholson with Nereo (owned by Deborah Sellar, Avebury (owned by Rosemary and Mark Barlow), Mr Cruise Control (owned by Nicky and Robin Salmon), Quimbo (owned by Deborah Sellar), Calico Joe (owned by In Mind Syndicate), Qwanza (owned by Rosemary and Mark Barlow. Jonathan Paget with Clifton Promise (owned by Frances Stead and Russell Hall), Clifton Lush (owned by Frances Stead and Lucy Allison), Bullet Proof (owned by Joe and Alex Giannamore). Mark Todd with NZB Campino (owned by Peter and Pam Vela), Leonidas (owned by Peter and Di Brunsden), NZB Land Vision (owned by Peter and Pam Vela). Caroline Powell with Boston Two Tip (owned by Alan Bell), Onwards and Upwards (owned by Mary and Cameron Crawford). Jonelle Richards with Mere Oak (owned by Lucy Sangster. Clarke Johnstone with Orient Express (owned by Johstone Family), Incognito (owned by Johnstone Family). Lucy Jackson with Kilcoltrim Ambassador (owned by Sprout Syndicate), Willy Do (owned by Mark, Gillian and Charlotte Greenlees). Jesse Campbell, Joe Waldron, Lizzie Brown and Tim Price.